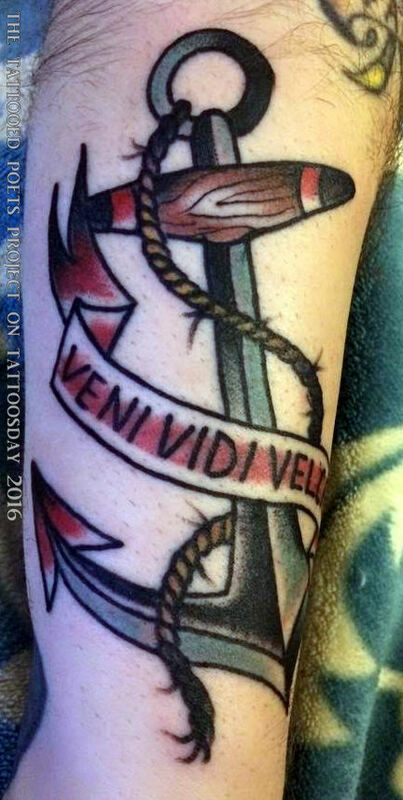 "I got this tattoo in April 2015, (almost) exactly one year ago. The banner 'Veni, Vedi, Velcro' was lifted from a poem entitled September 13th, 2001, written by one of my poetry mentors and former teachers at the New School: Paul Violi. 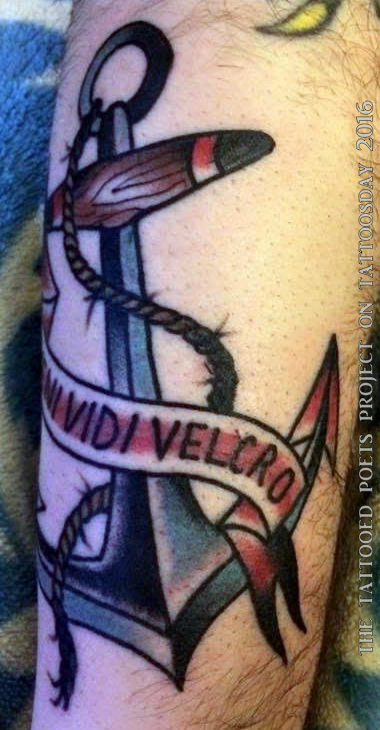 Besides being a tribute to the late, great Paul Violi, the classic image of an anchor (and the 'punny' banner) carry a dual meaning. On February 3rd, 2014, I was on my motorcycle en route to meet New York School mainstay Bill Berkson for lunch here in San Francisco, when I was struck by an SUV making an illegal U-turn. I had some very serious injuries (two compound fractures of my tibia and fibula, and a broken shoulder). Needless to say, I almost bought the farm -- so I literally 'came, saw, and stuck around', just like Paul's lines read! Here is an article written about the accident by SF's own poetry ambassador Kevin Killian. The tattoo was done by Courtney O'Shea of Let it Bleed Tattoo in San Francisco, CA." Aaron Simon is the author of Carrier (Insurance Editions, 2006), Periodical Days (Green Zone Editions, 2007), Senses Himself (Green Zone Editions, 2014), and Rain Check Poems (BlazeVOX [books], 2015). His poems have appeared in several publications, including Like Musical Instruments: 83 Contemporary American Poets (Broadstone Books, 2014), Shiny, Exquisite Corpse, Sal Mimeo, Across the Margin, Nowhere, and Harriet the Blog. He studied poetry and philosophy at The New School in NYC, and has lived between San Francisco and Brooklyn since 1999. 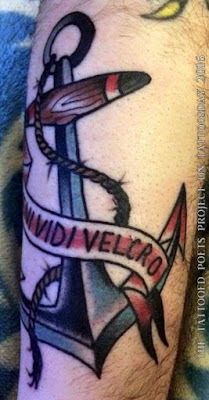 Thanks to Aaron for sharing his tattoo and poem with us here on The Tattooed Poets Project on Tattoosday!